The FBI's former deputy now potentially faces federal criminal probe. In a report made public by lawmakers last week, Inspector General Michael Horowitz concluded that McCabe repeatedly misled investigators looking into how sensitive investigative information ended up on in a national newspaper in the weeks before the 2016 presidential election. Horowitz’s office then referred the matter to the U.S. Attorney’s office in Washington, indicating Horowitz believes McCabe committed a federal crime with his actions. It’s unclear exactly when the referral was made. McCabe has become a frequent target of criticism from President Donald Trump and Republican lawmakers, who allege that McCabe's time at the top of the FBI was emblematic of political bias in the FBI's law enforcement work. McCabe's lawyers issued a statement Thursday afternoon saying they're confident no charges would be filed. "We were advised of the referral within the past few weeks. Although we believe the referral is unjustified, the standard for an IG referral is very low. We have already met with staff members from the U.S. Attorney’s Office. We are confident that, unless there is inappropriate pressure from high levels of the Administration, the U.S. Attorney’s Office will conclude that it should decline to prosecute,” the statement said. (Alex Brandon/AP, FILE) Acting FBI Director Andrew McCabe appears before a Senate Intelligence Committee hearing about the Foreign Intelligence Surveillance Act on Capitol Hill in Washington, D.C., June 7, 2017. In October 2016, the Wall Street Journal published an article that questioned whether McCabe was hampering the federal probe of the Clinton Foundation. Ahead of the story's publication, McCabe authorized an FBI spokesman and FBI attorney to speak with the newspaper about the probe and his own efforts to keep it moving forward, including the contents of a phone call months earlier about the matter with a senior Justice Department official, the report released Friday said. “Among the purposes of the disclosure was to rebut a narrative that had been developing … that questioned McCabe’s impartiality in overseeing FBI investigations involving former Secretary of State Hillary Clinton,” according to the report. The day after the article’s publication, McCabe spoke face-to-face with Comey, who expressed concern about information contained in the news article, according to the inspector general's report. According to what McCabe later told the internal investigator, he informed Comey that he had authorized the FBI spokesman and FBI attorney to disclose details about his previous phone call with a senior Justice Department official. Comey disputed that version telling investigators he was “very concerned” that the article included “sensitive FBI information,” and that McCabe “definitely did not tell me that he authorized” the disclosure, according to the report. Asked on CNN Thursday afternoon how he felt about McCabe lying to him and other investigators, according to the report, Comey answered: "Conflicted. I like him very much as a person but sometimes even good people do things they shouldn't do," Comey said. Saying "I'm not the judge in the case," Comey added, "I think it's accountability mechanisms working and they should work because it's not acceptable in the FBI, the Justice Department for people to lack candor. It’s something we take really seriously." Thursday evening Trump tweeted, "James Comey just threw Andrew McCabe “under the bus.” Inspector General’s Report on McCabe is a disaster for both of them! Getting a little (lot) of their own medicine?" James Comey just threw Andrew McCabe “under the bus.” Inspector General’s Report on McCabe is a disaster for both of them! Getting a little (lot) of their own medicine? 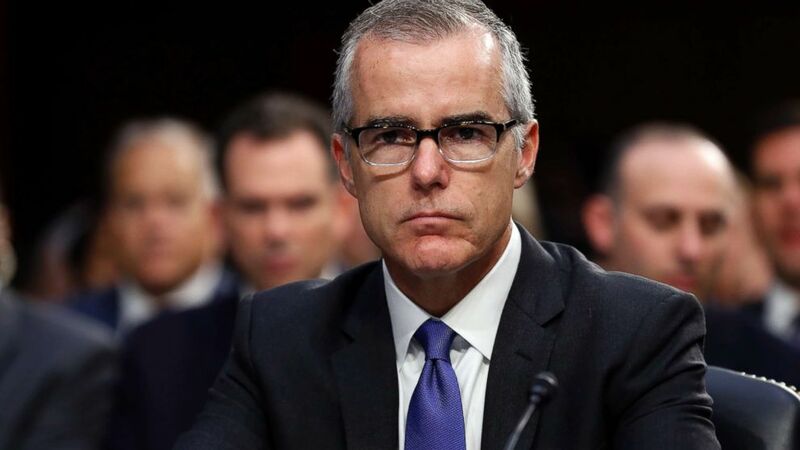 The inspector general began investigating McCabe in August 2017, after the FBI’s Inspection Division told the inspector general’s office that the deputy director may have lacked candor when questioned about his role in disclosing sensitive information to a reporter. “Mr. McCabe thought further about his discussion with the OIG investigators and realized that he needed to correct the record,” they said in a “factsheet” distributed to reported. Nevertheless, the inspector general also concluded that McCabe “lacked candor” in May 2017 when interviewed by officials from the FBI’s Inspection Division. He told them he had not authorized the disclosure to the Wall Street Journal and did not know who did, the report said. Beyond the accuracy of McCabe’s statements to investigators, the inspector general’s report released Friday also took sharp issue with McCabe’s move to authorize the media disclosure in the first place. “[W]e concluded that McCabe’s decision to confirm the existence of the [Clinton Foundation] Investigation through an anonymously sourced quote, recounting the content of a phone call with a senior Department official in a manner designed to advance his personal interests at the expense of Department leadership, was clearly not within the public interest exception,” the report said. But representatives for McCabe said he “had full authority to authorize sharing information with the media” as deputy director. “Their interaction with the Wall Street Journal (WSJ) was not done in secret: it took place over the course of several days and others knew of it, including Director Comey. It was done to protect the institutional reputation of the FBI as a non-political and professional investigative agency, and therefore was squarely within the public interest exception to the FBI’s prohibition on sharing sensitive material,” a “factsheet” from McCabe’s representatives said. In 2015, while McCabe was head of the FBI's Washington Field Office, his wife ran for state senate in Virginia as a Democrat. She lost the election in November 2015, and three months later McCabe became deputy director, giving him an oversight role in the investigation of Clinton's use of a private email server as secretary of state. After the Wall Street Journal story was published in October 2016, McCabe recused himself from the Clinton matter. McCabe first joined the FBI in 1996, investigating organized crime cases in New York. Over the next several years, he shifted his focus to rooting out international terrorists, and in 2012 he became the head of the FBI's counterterrorism division at headquarters in Washington. In October 2013, McCabe took over the FBI's entire national security branch, and the next year he moved to become the assistant director in charge of the FBI's Washington Field Office. McCabe stepped down as deputy director in January, and he was fired by Sessions in May. The U.S. attorney’s office and a spokesman for the inspector general declined to comment for this article.